Choosing the best technology solutions to address business challenges can be a daunting task for any company. Technology suppliers frequently enter and exit the marketplace, while offerings are often changed and enhanced. An even greater challenge is the ability to articulate and document business requirements from all functional departments and to prioritize them into core requirements that must be met by all potential solutions. Our requirements analysis and sourcing services rely heavily on analyzing your needs. We help your company document and prioritize all applicable requirements by functional role and identify the solutions that can meet these needs. 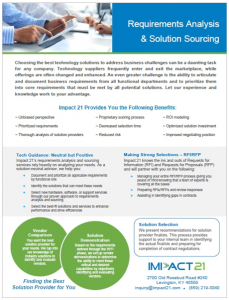 Impact 21 can help you through the process of selecting new hardware, software, or support services through our proven approach to requirements analysis and sourcing. Working as a solution-neutral advisor, we assist in helping you select the best-fit solutions and services to enhance performance and drive efficiencies within your organization. We’re positive we can source the right solutions tailored to your business. We know the ins and outs of Requests for Information (RFI) and Requests for Proposals (RFP). Impact 21 manages your entire RFI/RFP process, giving you peace of mind knowing that a team of experts is covering all the bases. We prepare RFIs/RFPs and review responses, assist in identifying gaps in contracts, document critical service levels in Service Level Agreements (SLAs), and identify best practices within the industry once a list of solution providers has been narrowed down. This allows you to focus on your business, while finding the right solution for your company based on facts and individualized requirements. We take things a step further to ensure a vendor is the best match for your company. Based on the requirements defined through the RFP phase, we set up vendor demonstrations to determine the ability to meet these critical and desired capabilities. This allows you really see how well providers can meet your needs. We present recommendations for solution provider finalists. This process provides support to your internal team in identifying the actual finalists and preparing for completion of contract negotiations.